The renowned Hornbill festival is undoubtedly the most popular tribal festival across North East India. Referred as the ‘Festival of Festivals’, it is a convergence of 17 Naga tribes who come from different parts of the state of Nagaland to showcase their culture and traditions. Though each of these tribes celebrates their separate festivals, Hornbill festival acts as a coming together of their inter tribal culture and heritage. The festival also helps in reviving the traditions and customs of the tribes of Nagaland. The colourful festival has myriad cultural performances, sporting activities and traditional arts on display. This festival also gives an opportunity for visitors to explore Naga cuisine and flavours. Spread over ten days from 1st to 10th December every year, Hornbill festival has completed its 19th year in 2018. The festival gets its name from Hornbill bird which is found across Nagaland and is also ubiquitous in the folklore of the tribes. Held at Kisama village, 12 Kms from Kohima, this cultural extravaganza has also boosted tourism in Nagaland with travellers, media and festival enthusiasts from world over heading to the state during the festival period. There are 17 tribes that participate in Hornbill festival and they are Angami, Ao, Chakhesang, Chang, Garo, Khiamniungan, Konyak, Lotha, Phom, Pochury, Kachari, Rengma, Sangtam, Sumi, Yimchungru, Kuki and Zeliang. All these tribes have their Morungs (indigenously designed houses) at the venue and it is here that they spend time to dress up and do their last minute rehearsals. This is the place one should visit early in the morning as the tribes can be seen in their complete attire and one can also capture some candid frames. They happily pose for you and are glad to break into a conversation. Inside the morungs, one can have a feel of the Naga homes which have a similar setting. All the morungs also serve Naga food and rice beer. Some of them even sell crafts and souvenirs. A walk around these morungs which are next to each other gives quite an insight into each tribe’s attires, dance performances, music and other details. All the tribes have their various dance and musical performances through the day. Hornbill dance by Ao tribe was an interesting one where they maneuver around like the movement of hornbill bird. Pulling of a log drum which is known as Tongten Senbu was another captivating act by Chang tribe. Kubo-Lichi Kemhou Ketsu by Chakhesang tribe is a performance where they blow the traditional trumpet. Cotton spinning song known as Tefu Kethyu Lu by Rengma tribe is sung by women for their lovers while spinning cotton. Thsakuk Nyingnying by Sangtam tribe is a dance where the movements are like that of a butterfly. Leaphet by Konyak tribe is an indigenous bamboo dance. Chant of the baby sitters by Phom tribe which is known as Nau-u Asho was another interesting performance. War dance by Sumi tribe and Victory dance by Lotha tribe were some of the other dances performed during the hornbill festival. There were also numerous other folk dances, harvest songs and traditional games by all the tribes on all the ten days of the festival. Apart from the tribes of Nagaland, there were performers from other states such as Manipur, Meghalaya, Assam, Madhya Pradesh, Odisha etc. As the sun set, most of the evenings concluded with contemporary music and carols. While numerous performances at the arena by various tribes keep all the ten days lively, there are a host of other activities that happen simultaneously. These include badminton, angling, horse riding, kids carnival, pineapple eating competition, chilly eating competition, stilt bamboo race, shooting competition, tug of war, fire making competition, strongest & fittest man competition, Miss Nagaland competition, Naga chef competition and many more. The venue also has a craft exhibition centre and an artist’s corner which display magnificent works of various artists. A carnival also happens in the city of Kohima when the main street is lined with stalls selling various things and local Naga cuisine. Bamboo pavilion has numerous stalls selling a plethora of items such as tribal jewelllery, Naga shawls, artifacts and souvenirs. There are also food stalls which sell cuisines other than Naga food. However, it is well recommended to explore the Morungs to relish authentic Naga delicacies. Even though Kohima is not far, it is recommended to stay in Kisama village to avoid daily commutation from Kohima. There are many camps near the venue where one can stay. 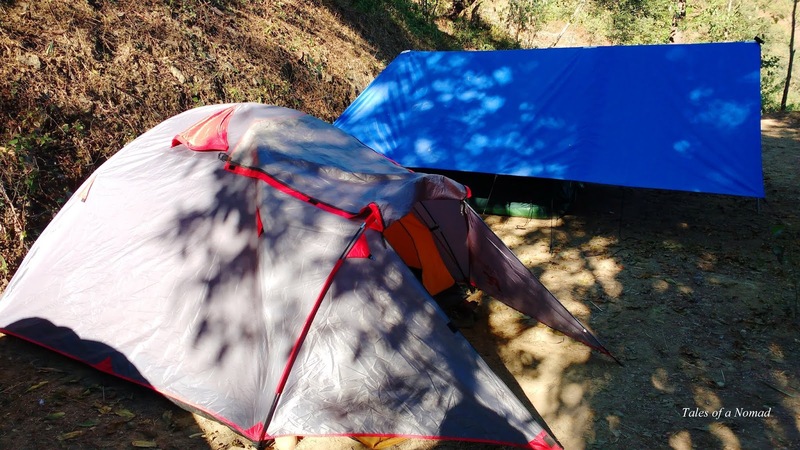 I stayed in a tent arranged by The Holiday Scout and it was a comfortable one. Sleeping bags and breakfast were also provided by them. Make sure to procure inner line permits (ILP) for Nagaland from the Deputy Commissioner’s office at New Delhi, Kolkata, Guwahati, Dimapur or Kohima. Visit the Morungs early in the morning before 8 AM for photography as it can get quite crowded as the day progresses. Kisama village is 12 Kms from Kohima, the closest major town. Dimapur which houses the nearest railway station and airport is 70 Kms away. There are regular shared taxis that ply between Kohima and Dimapur, and the charge is INR 300 per seat. One can also opt for the public bus service. Local Naga food is served at all Morungs. Additionally, there are food stalls within the festival premise that serve North Indian and continental cuisines. The Holiday Scout can arrange tents close to the venue. Each of these tents can accommodate 2 or 3 persons. P.S. : I was hosted by The Holiday Scout during my stay at Hornbill festival, but opinions are my own. Thanks for this informative story and the colorful viauals. Looks like a super interesting, cultural experience :)! Glad you liked it, Priscilla. It's a wonderful festival. This sure looks like a festival of festivals. It's a great idea to display (and make use of) their traditional dwellings at the festival, no? Absolutely an exciting festival with rich traditions and cultures. The dwellings are a great place to interact with them too. so many beautiful captures and detailed post on hornbill. looks so much cultural extravaganza. Thank you, Mayuri. Glad you liked it. Glad you liked it, Mubi. Thank you, Parnashree. Yeah, hope to experience all the ten days next time.